At midday, I am naked and broken by mistakes. When it is night, I no longer dream in colour. In my third year I took a poetics course as an elective, wanting to get back into the creative writing I had ignored for so long. The tutorials were intimate and rewarding; I found myself looking forward to them and talking to others before and after class. Eventually emails and phone numbers were exchanged, and I found myself on a picnic with three friends I now hold very dear. UQ had finally rewarded me. In the morning I shed old feathers, and let the rock salt glow in my stomach. After my undergraduate degree I began a Master of Arts in Writing, Editing, and Publishing with a friend I had met in that poetics course. It is here, in WEP, that I have felt a sense of community for the first time in my life. Despite age differences, I found myself getting along with nearly everyone and friends were becoming more and more common. Conversations are louder and the knots in my stomach began to unravel. Taylor-Jayne Wilkshire is a Brisbane based artist and writer whose works are inspired by birds and feelings of displacement. 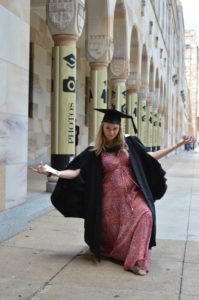 She is currently completing a Master of Arts at UQ. This entry was posted in Art, Friendship, Life at UQ and tagged 2010s, women achievers. Bookmark the permalink.